The concrete action undertaken by Rescue South Africa and Gift of the Givers is a clear expression of ubuntu. Ubuntu ngumuntu ngabantu. As we all know, many people remain buried under tons of rubble and debris waiting to be rescued. When we think of their suffering, we feel deeply and profoundly that we should be there, in Haiti, with them, trying our best to prevent death. To symbolize this readiness, we have decided to meet not just anywhere, but here, in the shadow of the Oliver Tambo International Airport. As far as we are concerned, we are ready to leave today, tomorrow, at any time to join the people of Haiti, to share in their suffering, help rebuild the country, moving from misery to poverty with dignity. Friends from around the world have confirmed their willingness to organize an airplane carrying medical supplies, emergency needs and ourselves. Dr. Aristide is Haiti’s first democratically elected president and remains the beloved and preferred leader of the vast majority of Haitian people. He was kidnapped and forced into exile by the U.S. military on Feb. 29, 2004, and has been living in South Africa with his wife and two young daughters. This statement was previously posted at HaitiAnalysis.com. 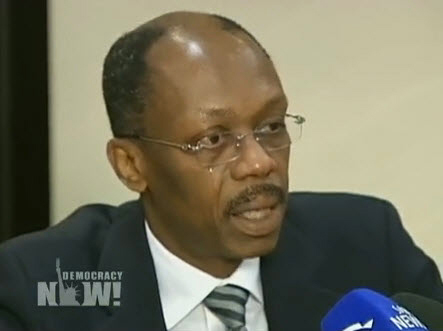 Watch Dr. Aristide deliver it on Democracy Now! his crocodile tears will not move many- while in the comfort of south africa he has yet to contribute a dime of the stolen money he is living off- and by the way the black caucus has also yet to raise one penny for haiti- mr. aristide never stopped to convince his “people” that america was an ennemy – and today it is the USA the leader in doing good along with the rest of the world- so while he is waiting for clearance to go back, he would need the ok of Mr Obama, Mr Bush without forgetting Mr and Mrs Clinton- so good luck! he so much had haiti prepared for a disaster that the slums he encouraged by having people abandon the provinces to come and live in filth in port au prince – those slums today have all collapse- so these deaths are on his conscience- this man sat for two terms, con all in the process, stole money, threatned, kidnapped, and in the end, left a broken country which has been set back 100 years- so to that kind of so call dictatorship under the wings of democracy – haitians so no more! In this game here you have need to gain of your numbers which come under the rule of free mahjongg connect. Every type of the single and double user game are very interesting with this format which you can easily play.